In this series, Dr. R.C. 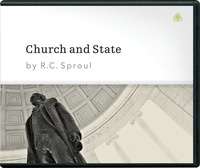 Sproul addresses the role of the church in government and the role of government in the church. He explains that government has been established by God to enforce order and stability in our land, and he shows how Jesus own teaching stresses the proper role of government. Also, in identifying the proper relationship between the church and state, Dr. Sproul examines the issue of civil disobedience.